Robin Kramer’s book, Then I Became a Mother, is not your ordinary mothering book. She doesn’t write about the latest baby product that you have to buy. She doesn’t tell you to let Baby cry it out, or that crying it out will psychologically damage your baby. Robin doesn’t weigh the pros and cons of breastfeeding versus bottle feeding, or staying at home versus working after the baby is born. Quite the opposite. Robin’s advice to new mothers is timeless. She writes about how all families are different and how to trust yourself as a mother. Robin comforts and consoles new mothers in her book, and also tells stories about her own mistakes and triumphs as a mother. Robin gives sage, motherly advice that you can turn to with your first baby, and then read again when you are expecting your second baby, and then your third baby! When I think back to when my oldest daughter was born, I remember a time of anxiety and worry, but also one of wonder and excitement. Having a baby really does change everything. All of a sudden, my husband and I were in charge of another little human being. It was so easy taking care of Lily when I was pregnant; and a much different task once we brought her home from the hospital and she cried and cried and cried! In the early hours of the morning, I threw myself on the couch in tears, covering my ears with pillows so I wouldn’t hear her cry. I didn’t know how I could be a mother. Fortunately, Ed and I soon figured out that I wasn’t making enough milk for Lily. (I’m a breast cancer survivor and have only one breast.) I breastfed her when I could, and Ed supplemented her feeding with a bottle. Lily soon became a chunky, happy baby! By the time Emmy came along, the whole parenting thing was a little easier. 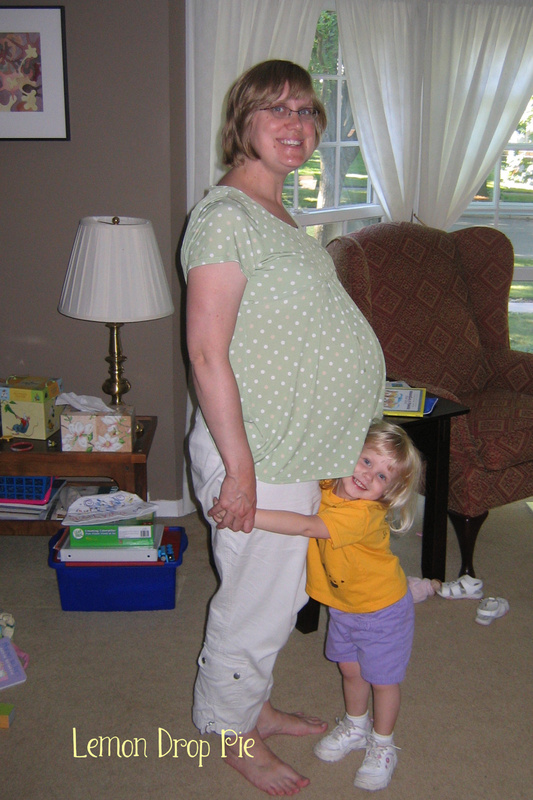 Robin, the mother of three children, takes us back in time to when her oldest daughter is a baby. She writes about the same emotions I felt as a first time mother; the same fears and worries and changes that come along with that tiny little newborn in the baby carrier. Then I Became a Mother is a perfect companion to that little bundle, and every new mother should read it! Then I Became a Mother is available at Amazon. As I read it I smiled often at the memories of becoming a mother myself. Robin sent me a copy to read and review, and I’m so glad she did! You can also connect with Robin on her website, Robin Kramer Writes. You’ll be glad you did! I loved this book so much. I finished it last weekend and I can’t stop smiling when I remember its advice. Scarlet never really cried – not at birth and barely at all as a baby. She is quite loud now, though. So it was really Des who introduced us to the “normal baby things”. And loudly. Tamara, oh man. Our firstborn broke us in (and hard!) which was a trial by fire entrance into parenthood. At the same time, it made the arrival of our next two babies easy in comparison, which was a roundabout blessing. Sweet! My brother and sister-in-law just had a baby a few months ago. I will pass it along! It is a wonderful book for new mothers! Wonderful! I hope that they enjoy it! This sounds like a wonderful book! I’ll have to check it out and then share it with friends. Thanks for your review. I love Robin’s book, too and she also truly brought me back to another time and place, when I first had Emma and that feeling of how could I be a mother to a screaming baby. Feeling my way around those first few months was definitely an experience, but one now I am thankful to have had, but can honestly say I truly don’t miss a screaming, crying baby. At least now when they do cry I can usually get to bottom of what it is that has made them cry. Oh, yes, I agree with you! It’s was very hard when I didn’t know why Lily was crying. I enjoyed having babies very much, but there are also some wonderful things I enjoy about my girls right now! Janine, I think the same thing! I look at mothers with newborns and I have NO idea how they’re managing — or how I ever managed that phase three separate times. I still love babies, but like you, I’m content with the stages my girls are in right now. We just can’t stop time from passing, can we? These little ones are determined to grow!